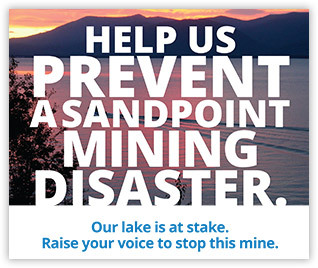 Help us prevent a mining disaster. Our lake is at stake. When you join Rock Creek Alliance, you’ll receive updates on the work we do, invites to public meetings and the satisfaction of knowing your donation is going directly to a single purpose—protecting a treasured lake and wilderness area from a monstrous threat. Plus, your donation is 100% tax deductible. You can join through our website or, if you prefer, you can send a check made out to the Rock Creek Alliance to P.O. Box 2636, Sandpoint, ID 83864. If you have questions, please feel free to e-mail us or call us at 208-610-4896. You can make an enormous difference simply by e-mailing decision-makers. Let them know that mining beneath a federally designated wilderness area—polluting public rivers, streams and lakes and jeopardizing wildlife—won’t be tolerated or condoned. Ask them to hold accountable the agencies under their jurisdictions, such as Montana DEQ, the U.S. Forest Service, and the U.S. Fish and Wildlife Service. Writing a letter to an editor can make a big difference in shaping public opinion, and it only takes a few minutes. Please keep your letters brief and talk about your personal connection to the issue. We recommend speaking out against the harm this mine will do to water quality, endangered species, the sanctity of wilderness and the local, recreation-based economy. Visit the What’s At Stake section of our website to learn how the mine threatens the very things we value most. You can can help support our efforts to stop the Rock Creek Mine through your tax-deductable donation. We use these funds to provide education, outreach and to support legal action against mining activities in the Cabinet Wilderness area. With your help, we will continue to fight as long as necessary! Get involved by volunteering your time, energy, and creativity!